What a charismatic fellow Levi was to me. You just knew he had something special to offer everyone and as others have said, he had time and spirit for everyone who spoke to him. I remember at Simchas Torah; Levi would like to tumble and after each roll, I would offer him a little glass of Scotch, which he appreciatively drank with aplomb. This went on for quite awhile until the tumbling ceased. He was always a good sport and loved to interact with everyone. When he announced his illness two years ago, I along with everyone else was dumbfounded. How could this be to one so young and vigorous? I could only accept his quiet determination to keep the shul going and not to focus on himself. I was invited to Shabbos dinner with the family a month ago, and saw how weak and ill he was. Still, he said nothing about his illness and carried on with good humor during the entire dinner. I will always remember him for that beautiful invitation to his home and family that evening. R' Levi, we love you and admire your will to live and to bring us all closer together as a people. In Gan Eden you can be counted on to be among the greats. 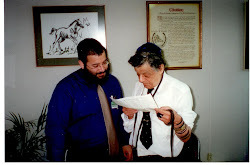 Your work will go on in the good hands of Rabbi Chessy and Rabbi Mendy. Nothing is lost. Your soul lives on in them and their work. I wish to extend my thanks, appreciation and condolences to the families, at this time of recollection and remembrance of the Good Rabbi.